A pioneering physicist from The University of Manchester has been awarded a highly prestigious European science prize for his discovery of an exciting new material. Prof Andre Geim FRS has received the 2009 Körber European Science Award for his discovery of two-dimensional crystals made of carbon atoms – and particularly graphene. The discovery made headline across the globe and has the potential to revolutionise the world of microelectronics. The Körber European Science Award supports European scientists who are pursuing particularly innovative research projects. 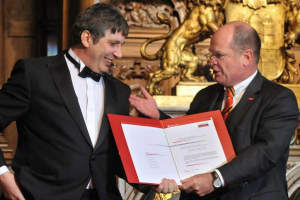 The Euro 750,000 prize was presented to Prof Geim by the Körber Foundation at a plush ceremony at Hamburg's city hall on 17 April. Graphene not only promises to revolutionise semiconductor, sensor, and display technology, but could also lead to breakthroughs in fundamental quantum physics research. The super-thin two-dimensional material, which has become one of the hottest topics in physics in recent years, consists of a single layer of individual, densely packed carbon atoms that are woven into one stable layer like a wire mesh. Prof Geim has succeeded in using graphene to develop prototypes of tiny transistors – and he believes that in the not all too distant future, graphene transistors could replace those made of silicon. Since discovering graphene in 2004 with fellow Manchester researcher Dr Kostya Novoselov, Prof Geim has published many high-profile research papers on his graphene discoveries in prestigious journals such as Nature and Science. In 2008 Prof Geim and Dr Novoselov received the prestigious Europhysics Prize, while Geim also received the 2007 Mott Prize for his work on graphene. Prof Andre Geim was born in Russia in 1958 to German parents. He studied physics in Moscow and was awarded his Ph.D. by the Institute for Solid State Physics in Chernogolovka, Russia, in 1987. After working there for another 3 years, he conducted research in England and Denmark. In 1994, he was appointed Associate Professor at the University of Nijmegen in the Netherlands. In 2001 he moved to the University of Manchester and is currently Chair of Condensed Matter Physics, Langworthy Research Professor and Director of Manchester Centre for Mesoscience and Nanotechnology. The Körber European Science Award is presented annually to scientists working in Europe for their outstanding scientific achievements and in particular for their future-looking research projects. An international trustee committee under the chairmanship of the president of the Max-Planck-Gesellschaft, Professor Peter Gruss, decides on the awarding of the prize. Among its winners are the Nobel laureates for medicine Luc Montagnier and Françoise Barré-Sinoussi. For more information please see www.koerber-award.org.